Select Beats: Select the beats you want to buy in the player and click ‘+ADD’. 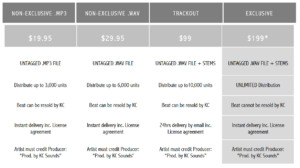 Select Licence: Choose from 3 licences; Exclusive, Non – Exclusive .wav or Non – Exclusive .mp3. When you select the licence it will be added to your cart. Buy Now: Click the ‘BUY NOW’ button to make your way to Paypal and complete your order.